Fall is in the air, with September giving way to October. It’s time to assess the real estate market through the end of the 3rd Quarter 2014.
its upward trajectory, the south side has exploded.The south side of Bozeman has 47% of the number of homes sold (17 of 36) and 49% of the sales volume ($25,227,601 of $50,878,333) for homes priced $750,000 and above. These south side homes are averaging $1,483,976 per home. Platinum Properties is responsible for 22% of the south side’s sales volume, averaging 92% of asking to sold price while the rest of the market is averaging 90.5%. 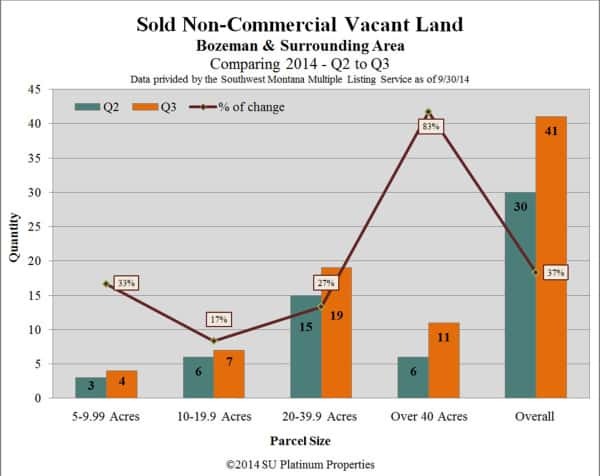 The following report, prepared by Platinum Properties, is compiled from Southwest Montana Multiple Listing Service for areas 1 and 2 (inside and outside Bozeman’s City Limits), which encompasses the greater Bozeman Area. The report focuses on Bozeman’s 3rd Quarter real estate market for homes priced $750,000 and above and on non-commercial vacant land with 5 acre minimums. 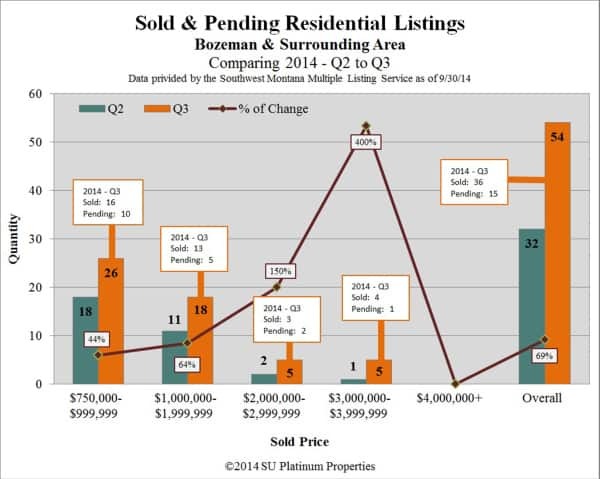 Platinum Properties continues to dominate the upper-end home market in Bozeman. We have closed 24% of the total volume of sales $750,000 and above. We have participated in 5 of the 10 properties closing at $1.5 Million and above, accounting for 45% of the total volume of sales. 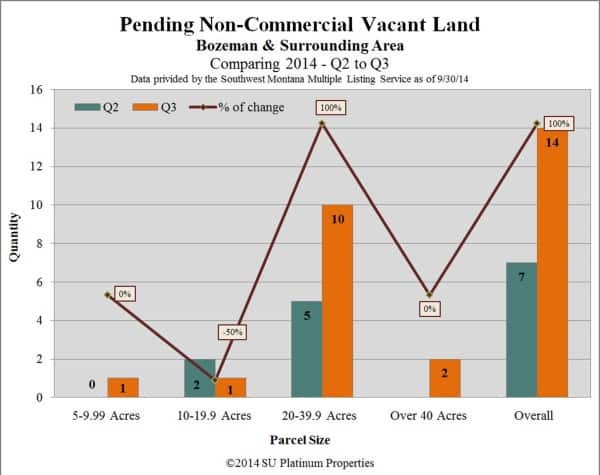 In Bridger Canyon, Platinum Properties has posted 66% of the sales $1.5 Million and above in 2014. Our listings include 33% of properties priced $2 Million to $3 Million, and 50% of properties currently listed over $3 Million. We have the highest recorded sale for 2014. The market continues to be focused and fluid, with buyers and sellers having to work together, through their Realtors, to bring a transaction to completion. It is neither a buyers’ nor a sellers’ market. It is a time for sellers to be thoughtful in their pricing if they really want a strong chance of selling, and for buyers to be willing to negotiate a fair price. Closed transactions have increased.At the end of the 3rd Quarter, the volume of closed transactions total $50,878,333. This is a 285% increase over the $13,204,579 2nd Quarter figure. To date, 36 properties, priced $750,000 and above, have closed, with Platinum Properties participating in 10 of the 36 transactions. An additional 15 properties are under contract. The combined 51 closed and pending sales represent a 64% increase over the 33 homes sold or under contract at the end of the 3rd Quarter 2013, and a whopping 62% increase over transactions at the end of the 2nd Quarter 2014. Inventory levels have remained fairly constant with 14 homes currently listed at $750,000 and above compared to 145 listings at the end of the 2nd Quarter. However, inventory levels are 11% higher today than a year ago, when 135 properties were listed. It is also noteworthy that, while inventory levels from 2nd Quarter 2014 to now have increased in the $750,000 to $1 Million range, they have decreased in the $1 Million to $4 Million range. There are 86 properties priced $1 Million and above, with Platinum Properties representing 20 of these fine properties. The summer season did not bring the numbers of first-time-viewing buyers we had hoped for. We noticed a marked decrease in activity from the Spring in first-time-lookers. Real estate is definitely cyclic and unpredictable. A majority of the closed transactions this quarter were initiated in the 2nd Quarter. Generally, a buyer will visit 2 to 3 times prior to settling on a property. They are picky, with few buyers willing to undertake a major renovation. They arrive here having done their internet homework and are already focused on specific properties due to location, amenities, pricing, styling, and the size of the home. pool of potential buyers decreases…rapidly. Bozeman is a small, niche market. Only 10 homes priced $1.5 Million and above have sold! While homes are averaging 92% of listing price, we average 94% of listing price. However, that is the current listing price, with a majority of homes in the upper levels undergoing at least one or more price adjustments. The 26 homes priced between $750,000 and $1.5 Million that have closed this year, averaged 179 DOM (days on market), while the 10 homes priced over $1.5 Million, averaged 439 DOM. 62% of the sales this year are for homes under $1.5 Million. 44% of sales are homes priced $750,000 to $1 Million. Bridger Canyon accounted for the second highest number of sales, after the Southside, with 9 of the 36 closings to date, averaging 90.5% of asking to closing price, and contributing 31% of Bozeman’s total sales figure. Homes north of 1-90 came in 3rd, with 8 closings and 15% of the market share in volume. 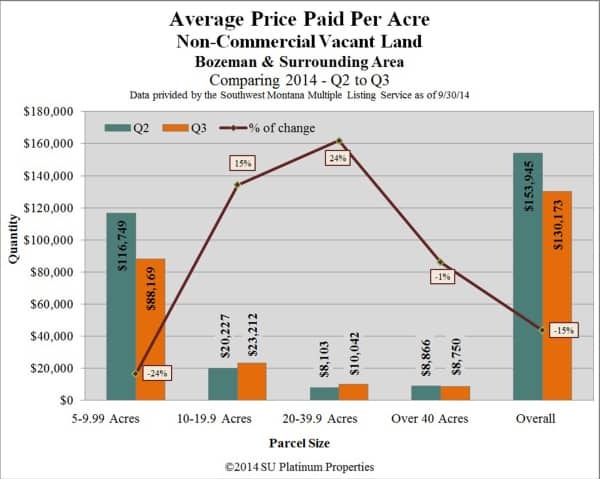 Vacant land sales continue their slow and steady recovery. There have been 244 land transactions this year that are not specified commercial land, but only 41 sales are for 5 or more acres. The properties averaged 87% of their asking price, with average per acre prices increasing in all but the 5 to 10 acre category. Parcels of 5 to 10 acres are getting 98.5% of asking price, and are averaging 503 DOM. 20 to 40 acre parcels are averaging 114 DOM, while this increases to 343 DOM for parcels over 40 acres. Trail Creek property continues to be desirable, posting 4 transactions of 20 acre parcels averaging $7,253 per acre. 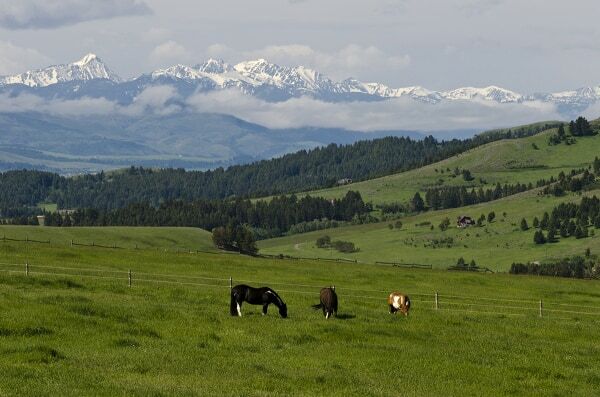 Bridger Canyon has experienced a drop to an average of $4,845 per acre. There have been 8 closed transactions in Bridger Canyon. Seven of them are for 20 to 30 acre parcels, averaging 88% of asking price to closing price. The highest price per acre and the highest acreage sold this year in Bridger Canyon is for just over 40 acres, at $8,750 per acre. Gallatin Gateway has also posted 8 transactions, with 5 of them for 21 or less acres, and two 40-acre parcels in 7 Ranges. Per acre prices in Gallatin Gateway have averaged $10,042. The 41 closed transactions represent a 136% increase over the 2nd Quarter of 2014. The largest acreage sold to date is 237 acres in Trail Creek that sold for $1,788 per acre. There are only 3 parcels of 100 acres or more closed for the year. The highest sales figure is $1,570,000 for a 157 acre parcel in Four Corners, at $10,000 an acre. always welcome your comments and questions. Please contact us! 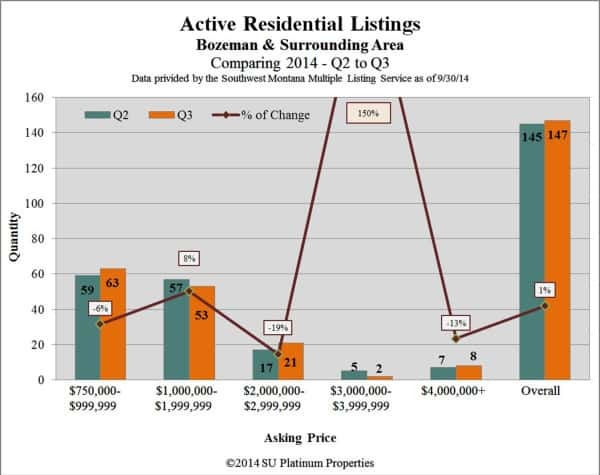 Download a copy of the 3rd Quarter 2014 Bozeman Real Estate Market Report.